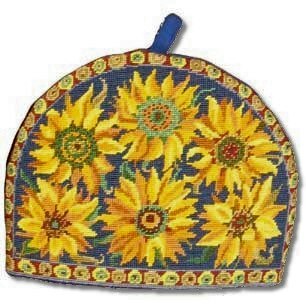 A beautiful teacosy covered in bright sunflowers on a dark blue background - a wonderful addition to any tea tray! The kit uses Anchor tapestry wool on 12hpi canvas and measures 12¼ " x 10½ " (32 x 27cm). Contents: Full colour printed canvas, wool, needle and instructions.